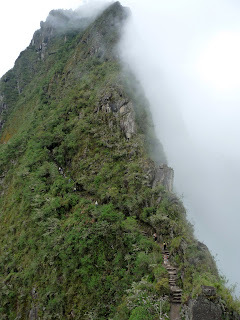 The trek up 2,634m Wayna Picchu looks impossible from below. It rises steeply from nothing, a sheer face just reaching directly for the clouds and beyond. Jenny was not a happy camper. We were already wrecked from the long hike the day before, and the arduous trek up to Machu Picchu itself, not to mention the lack of sleep, oxygen and nourishment. 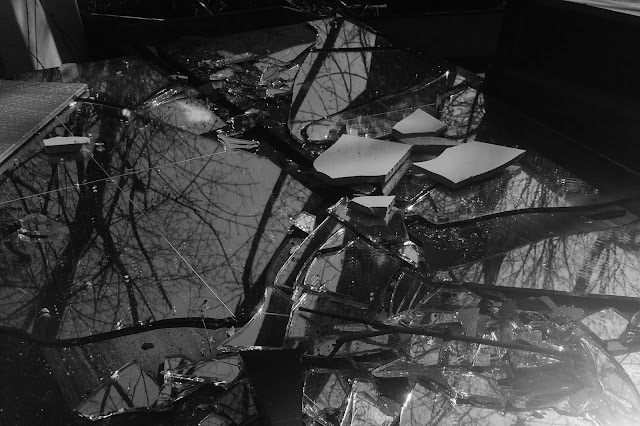 "This is what we got up at three o'clock for," I told her, receiving in return a look like thunder. I too wished we'd stayed in bed and not bothered at all. We set off up the steep track and soon knees were creaking and legs aching again as we tackled more never-ending steps, clutching the steps in front to avoid falling back. The weight of my rucksack threatened to send me hurtling back the way I'd come, backwards into the abyss. Up up up we went, tired and grumpy, unable to appreciate the incredible scenery around us, panting and gasping as we forced our reluctant legs to lift and then lift again. Eventually, 45 slogging minutes later, we finally emerged at the top. We're enveloped in cloud, can't see a thing. We pause for breath and wait, wait for the clouds to part for a glimpse of Machu Picchu below, any excuse. The clouds eventually oblige but we're beyond caring at that stage. It's time to begin the slow climb back down. We gingerly pick our way around the rocks and steep steps, steps uneven and treacherous. One mistake and you're gone. It takes almost an hour to get down, almost as much as it did to get up. I've definitely seen enough now. I just want to leave. My knees are in bits, legs are shaky, I'm thirsty, hungry and exhausted. I've had enough! 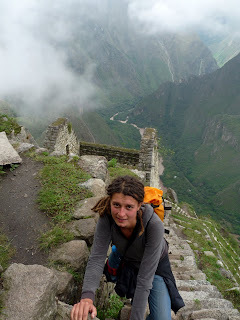 We leave the Machu Picchu site and begin the trek back down to the town. Again it takes yonks, calves and knees moaning and complaining all the way. Another hour and 15 minutes it takes back to Aguas Calientes where we buy three bottles of water. Absolutely fucked. The backpack weighs three tonnes. Can't go any further. Thank Jaysus we'd made it. I'm glad to have done Machu Picchu and Wayna Picchu behind it, but to be honest, I'm happy too it's finally over.